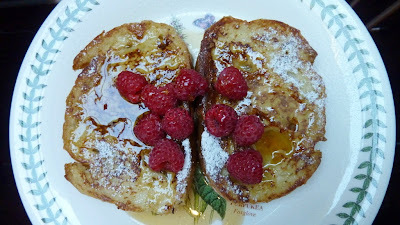 YUMMO - 365 Days of Eating and Being Fed : Birthday Kaluha and Raspberry Sourdough French Toast - Best Way to Start a Day! Birthday Kaluha and Raspberry Sourdough French Toast - Best Way to Start a Day! D warned me the night before not to eat in the morning. He has to because lil T gets me up at the crack of dawn and I eat before D wakes up. He prepped for my birthday breakfast the night before but I still didn't suspect. He made me an awesome dinner as well but I'll post the Seared Scallops on Cauliflower Puree and Homemade Lobster Ravioli in Heavenly White Wine Cream Sauce later. For now, I'll brag about my awesome birthday brekkie treat! D knows I have a Bread addiction but I'm also a Bread snob. No airy tasteless bread for me! That's why I love the idea and flavour of Sourdough, mmmm. It adds a nice tangy, hominess to French Toast. It's like the way it was meant to be, a use for leftover bread. D bought the round the day before and sliced it 1inch thick and left it in a slightly open paper bag over night. I ate the butts for dinner. I didn't even asked where the middle went. Odd. Slice and leave the bread out overnight. Letting the Bread go stale a bit will prevent it from sopping up the Custard like a sponge and dissolving. Whisk all the Eggs, Milk, Sugar, Vanilla, and Kaluha together in a shallow baking dish that is not too big but can fit two slices of bread at least. Heat a nonstick pan on Medium with a pat of Butter. Let the bread soak for 20 seconds on each side. Lift carefully and let the excess fall away and place in the pan. Let cook for a couple minutes on each side. It should be golden brown before flipping. It should puff slightly. Happy birthday to you indeed! How sweet to have breakfast made for you, and something so decadent to boot. It looks (and sounds fantastic). You have a bucket load of vanilla beans? Jealous!